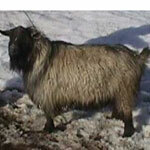 The pygora goat is a cross between a pygmy goat and an angora goat. 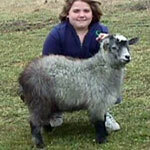 The first pygora goats were originally created by crossing a registered American Angora Goat Breeders Assocation (AAGBA) goat with a registered National Pygmy Goat Association (NPGA) goat. The first generation from this cross is considered a hybrid. 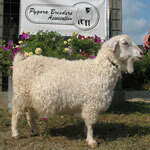 Second and subsequent generations are considered true pygora goats. 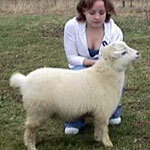 A pygora can be bred back to either an NPGA or AAGBA goat, but the parent breed ratio cannot exceed 75% for either pygmy or angora. 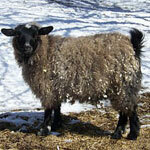 Pygoras produce three distinct kinds of fleece: a cashmere-like fleece (Classified as Type-C), a mohair-like fleece (Type-A), or a combination of the two fleeces (Type-B). 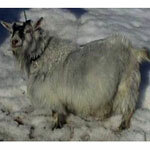 A pygora goat typically lives 12-14 years and they make great pets in addition to being show, breeding, and fiber-producing animals. 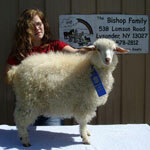 Pygora goats can also be milked and produce approximately one quart per day.